Crown Prince Naruhito and Crown Princess Masako of Japan arrived on Sunday 28 April at Schiphol, the Netherlands, as guests for the abdication of Queen Beatrix and the investiture of the new King. They arrived with this Boeing 747-47C with serial 20-1101. 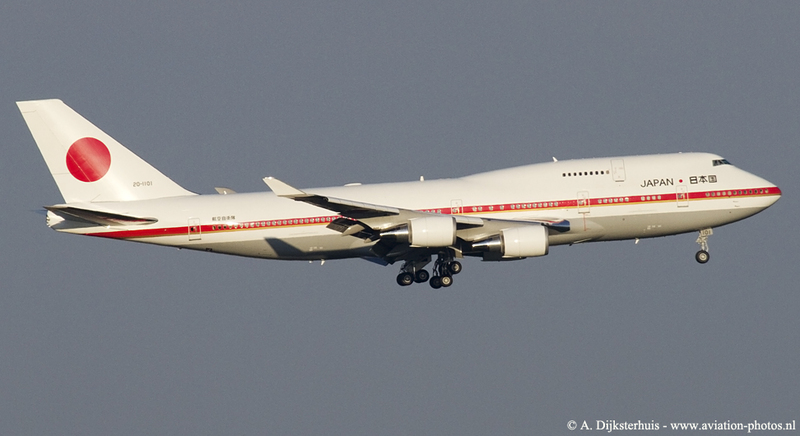 The aircraft is operated by 701 Hikotai of the Japan Air Self-Defense Force (JASDF). On 30 April the Queen signed the instrument of abdication in the Royal Palace, Amsterdam. This is the constitutional procedure by which she formally relinquishes the throne. Once the instrument was signed, the Prince of Orange became King under constitutional law. The investiture of the new King took place on the same day in the Nieuwe Kerk in Amsterdam.